When: If you would like to teach more than one language, you need to set up a second Teacher profile. Why: A teacher profiles is setup for one language only. 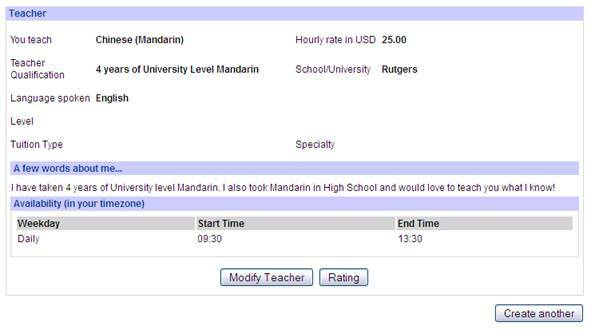 You will need to setup a second Teacher profile to let Lingworld students about the second language you teach. 1. Click Change to Teacher in the Change Role section of the navigation pane. 2. Click Teacher in the My Profile section of the navigation pane. 3. The Teacher details screen opens. 4. Click the Create another button. The Create profile screen opens. 5. Fill out the fields on the My Profile [Add Teacher Profile] screen as accurately as possible. The My Profile [Add Teacher Profile] fields are described below. 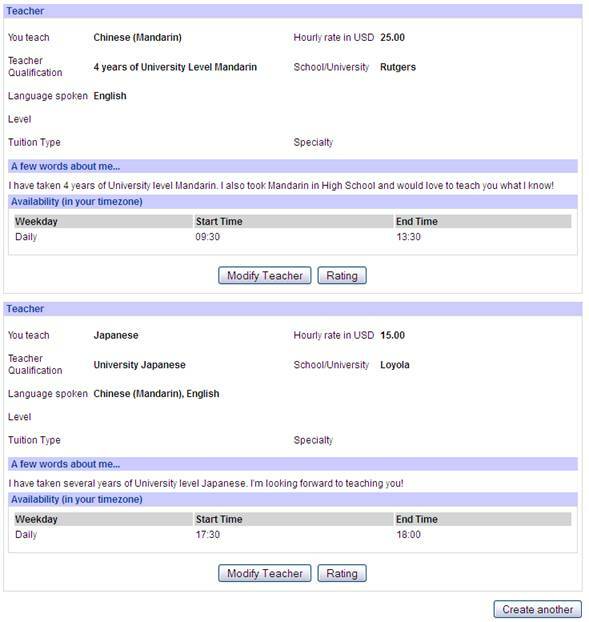 Select the language you will be teaching from the You teach dropdown list. Choices include: Chinese (Mandarin), English, French, Japanese and Spanish. Type your hourly rate in US dollars in the Hourly rate in USD field. 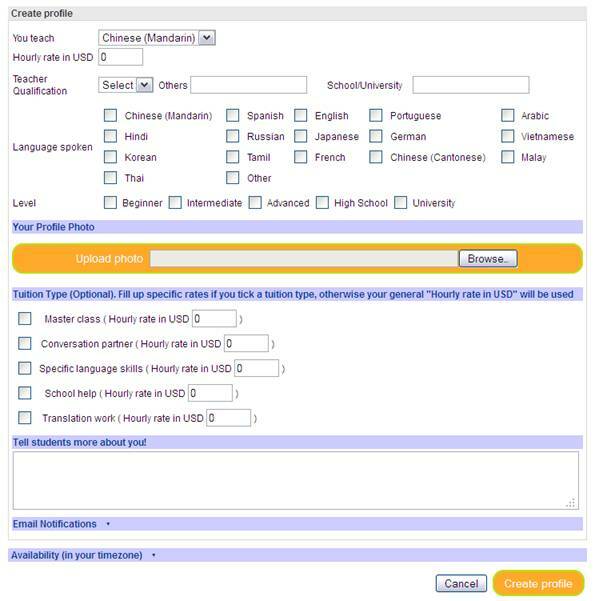 Select your teaching qualifications from the Teacher Qualification dropdown box. Choices vary according to the language you are teaching. If you have a teaching qualification other than those listed in the Teacher Qualification dropdown, type it in the Other field. Type the name of the school or university where you earned your teaching credentials in the School/University field. Check the box(es) next to the language(s) you speak. Choices include: Chinese, Spanish, English, Portuguese, Arabic, Hindi, Russian, Japanese, German, Vietnamese, Korean, Tamil, French, Chinese (Cantonese), Malay and Thai. If you speak a language other than those listed, check Other. Check the box(es) next to the level(s) you are available to teach. Choices include: Beginner, Intermediate, Advanced, High School and University. 1. Click the Browse button in the Upload Photo section of the screen. 2. Browse to the location of your photo. 3. Click Open. The photo uploads to your profile. You can enter different fees for different types of classes. Class types include: Master Class, Conversation Partner, Specific language skills, School help and Translation work. Type the desired amount for each type of class into the corresponding fields. Type any additional information you would like to share with users on this site. Check the Notify me when there is a new student that matches my criteria checkbox to receive an email when a student matching your criteria joins the site. Click the Availability heading to view the availability matrix. To add a timeslot, choose the day for the slot in the Weekday dropdown. Next, choose the start time for your availability from the Start Time dropdown, and the end time for your availability from the End Time dropdown. Click the Add Timeslot button to add the timeslot to the Availability matrix. All times are local to your timezone. 6. Click the Create profile button. Both Teacher profiles are available in the Teacher details tab of your Teacher profile.